Hi, I’m Alyssa and I’m a research student in the Lizard Lab. My project involves working with Texas Spiny Lizards. 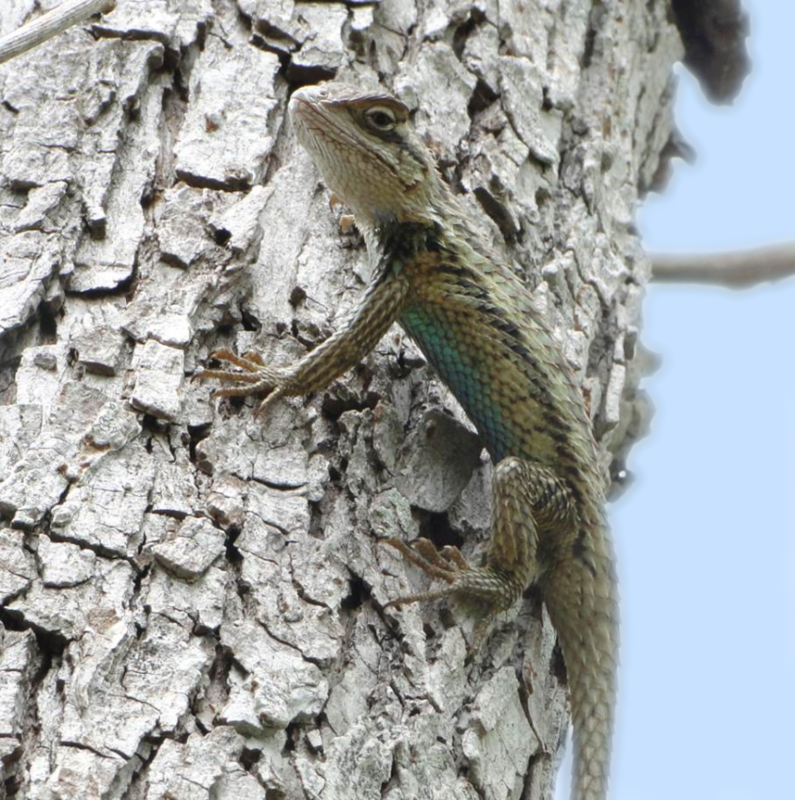 I am using DNA to see how lizards in different parks in San Antonio are related to one another. In the past year, I have caught over 200 lizards! The Texas Spiny Lizard likes to hang out on trunks of trees, and this is where I catch them when I am walking through a park. When I catch a lizard, I take a small piece of the end of the lizard’s tail that I can use to sample the lizard’s DNA. I also measure the mass and length of the lizard, and record the GPS location so that I know exactly where I caught each lizard. After I’ve taken these measurements, I let the lizard go right where I caught it. Then, I go back to the lab and use the tail sample to look at how each lizard is related to the others I have caught. I also use the GPS information to see if lizards that live close together are more likely to be related to each other. So far, I have found that lizards in the same park are usually close relatives. I also compare how lizards in different city parks are related to one another. In some cases, parks are connected by a natural area called a corridor. If lizards move between two parks using a corridor, the lizards in those parks may be closely related to one another. I use methods from a field of biology called “population genetics” to study these patterns. I hope my work will help us understand how we can best conserve lizard populations in urban habitats, by learning what kinds of connections between parks allow lizards to be most diverse. I am looking for a picture of some rather large lizards body about 6or8 inches long with heavy dark green stripes lengthwise of the body, the tail is long too. To me they are beautiful and I would like to encourage their stay at my home in the country here in Texas, that is if they are not to dangerous to have around. Can you tell me more about them and possibly show me a picture of some that you may think they are. Hi Gabrielle – I’m not sure exactly what kind of lizard you’re describing. Perhaps a whiptail? The Herps of Texas website has a great list (with pictures!) of all the Texas lizards at http://www.herpsoftexas.org/view/lizards – this might help you determine what species you’re seeing. And, there are no dangerous lizards in Texas! Alyssa is a senior Biology major using genetics to study lizard conservation in city parks. She's studied abroad in Africa, and she has a pet-sitting business too!